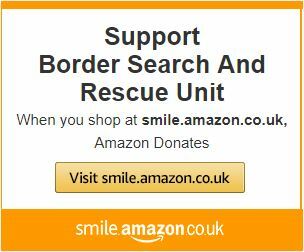 The Border Search and Rescue Unit evolved from the Yetholm Rover Scouts, in the early 1960's, and were joined a little later by members of the Cheviot Walking Club. 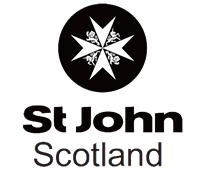 The unit became recognised by the police in September 1963, and it was the only team in the whole of Southern Scotland. 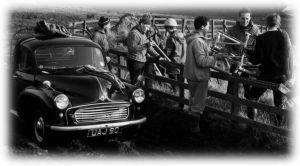 The photo to the right shows the team on a training exercise in 1963; the member on the right with his back to the camera is a (slightly younger) Jock McCraw, who was Team Leader until 2007. 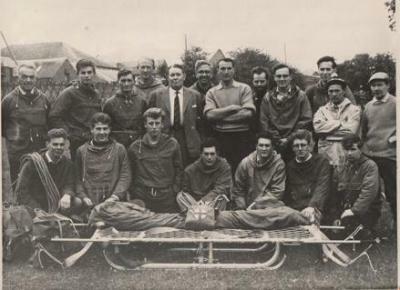 In the early days the team relied on very basic equipment, as well as members using their own transport; it was 1990 before the team purchased its first official vehicle. Looking at the team now the progress is obvious: three fully equipped rescue ambulances, with all the necessary technical and life-saving equipment, state-of-the-art radio communications, high quality outdoor clothing allowing the team to operate in even the most severe conditions.